Projects in 20 cities, Rs 2 lakh crore in committed investments, Rs. 2 lakh crore in the pipeline. Clearly, India’s urbanism is riding into a metro rail future, although gaps remain in making city transport systems ‘smart’. Ten cities in the country are implementing metro rail projects, most of them from a zero baseline, since they either have no such facility or have only an obsolete rail system. The new trains are comparable to climate-controlled, secure facilities serving passengers in global cities. In the case of the ten other cities, detailed project reports are being prepared. Kolkata was the metro rail pioneer in the pre-liberalisation era, while Delhi is today’s icon. Urban planners have concluded that 64 cities have the potential for some form of efficient rail transport today, and 22 of them readily qualify for a full-fledged Metro system. In the case of 42 others, it would have to be less expensive alternatives such as light railways, or bus rapid transit systems. 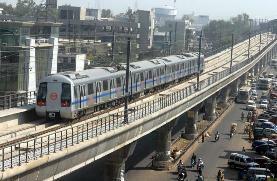 India’s metro story, however, needs a stronger base in order to become sustainable. Rail technologies and big consortia to implement them may be available off-the-shelf, but two key fundamentals have not been fully addressed: a reliable source for funding, and engineering manpower. That is the message to the Centre and State governments from ‘Metro Man’ E. Sreedharan, whose range of projects spans the Konkan Railway, the Delhi Metro, and several upcoming urban rail projects including Kochi’s (which is set to create a record for speedy implementation), and Vijayawada region’s, being pursued aggressively by Andhra Pradesh Chief Minister N. Chandrababu Naidu. “By themselves, metro projects are not profitable,” says Mr. Sreedharan. “The Centre should set up something like a financial corporation only for these, with seed money of Rs. 10,000 or 20,000 crore, with responsibility to raise money on behalf of the Government of India,” he suggests. A model like the Indian Railway Finance Corporation would work better than Public Private Partnerships or Build-Operate-Transfer. There is another option to raise money for such projects: introducing disincentives to the use of personal vehicles in every city. “Singapore has laws to keep the number of personal vehicles low and a congestion surcharge. Fuel cost is kept artificially high,” Mr. Sreedharan points out. It has also worked in London. An official assessment of the London congestion charge six years after introduction found that 30 per cent of those previously driving a car in the relevant area stopped doing so. A ten-year assessment showed that a net revenue of 1.2 billion pounds was available to feed into the improvement of the British capital’s transport infrastructure. What is important to note is that the funds generated from the ‘green charge’ were predominantly assigned for transport improvement, including the bus system. A congestion charge or even a charge on fuel in the 64 chosen Indian cities could fund metro and other transport projects efficiently. Metro rail projects in the country are also slowed down by the non-availability of land in urban areas. Here, Mr. Sreedharan favours the use of land acquisition laws. “It is a major obstacle in any Metro construction, but we have to tackle it. Land acquisition is most difficult in a state like Kerala, but even there we are able to manage. I don’t see it as a major hurdle, particularly with the new law, which provides for three times the market compensation rate. The new Land Bill will expedite not only Metro, but all infrastructure projects,” he says. The fast-paced construction of metro rail projects in many cities, however, does not eliminate a fundamental problem facing the commuter. Multiple authorities govern each segment of a passenger’s daily travel, and they don’t work together. As a result, there are not enough buses; taxis and autorickshaws are poorly regulated and unauthorised operators are often in the fray. Also, Intelligent Transportation Systems relying on IT are absent and city managers have no accountability. So, will metro rail systems spark a change? They can, says Mr. Sreedharan, citing the example of Kerala. Kochi, he says, will introduce a travel card, for use on buses, Kochi Metro, and boat services. It will be a smart card valid even in supermarkets. “This system is available in Korea and Japan, and it can be easily brought in here. No new technology needs to be developed,” he adds. That optimism will depend on the State government’s commitment, since a similar effort did not take off in Delhi where “cooperation was not forthcoming”. As the key adviser to several upcoming metro rail authorities, Mr. Sreedharan stresses standardization as the way to a less expensive network. A standardised metro system that is replicated in multiple cities could cut the cost by as much as 20 per cent. That would mean standard gauge, coach design features, signalling and so on. Training young engineers to become competent contractors is another prerequisite. “Given the incentive, there are enough engineers to be trained through specialised courses like the one at IIT Delhi in metro projects. IITs are prepared to start these courses. There is no need for basic training, only Metro training as a top up,” he says, lamenting that the new government at the Centre is not making many of the necessary changes. Next articleMEGA Metro: MEGA metro converted to SPV as joint venture between Center & State Govt.